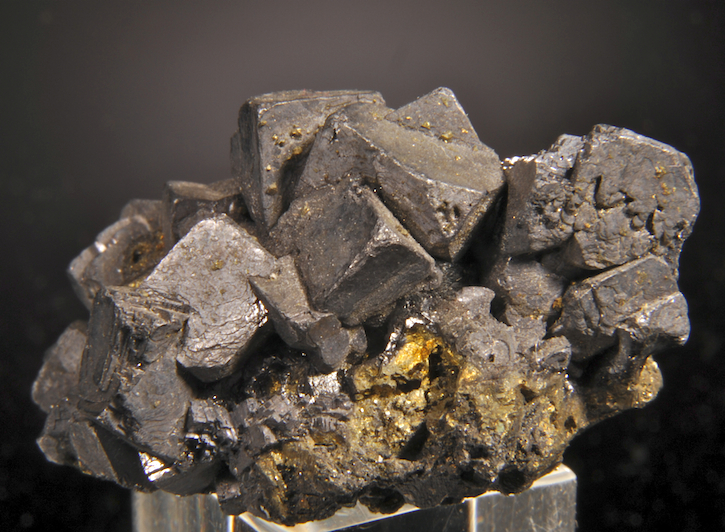 Classic older Colorado Galena with well formed, complex cube crystals and a good contrast with the golden Chalcopyrite. Ex Ernie Schlichter, this is in very good condition (no eye visible damages) and quite 3 dimensional, a nice miniature with good luster. A really esthetic example from the great find of 2012 which was the best in nearly 20 years. This find had many average pieces but very few that were fine. These are now unavailable in this quality and condition. 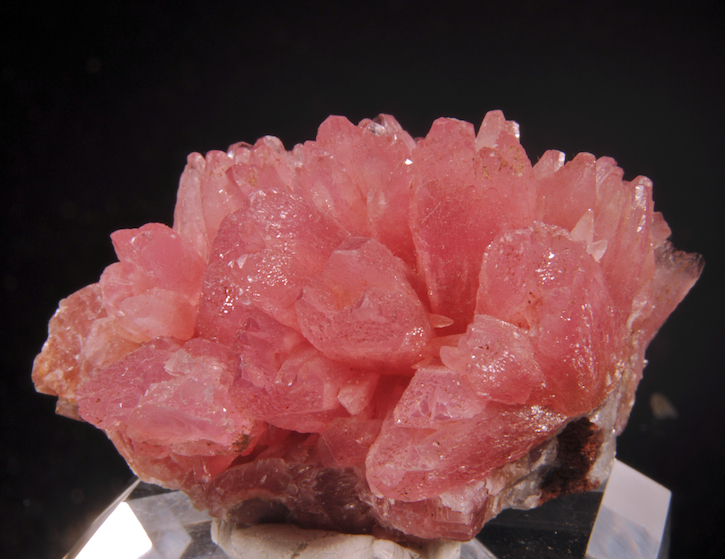 Great color and fine form, these scalenohedral crystals are in some cases hoppered or hollowed cavernous spikes in a radiating cluster. Some damage is noted mostly on the outer edges, but the central main display area is pristine. 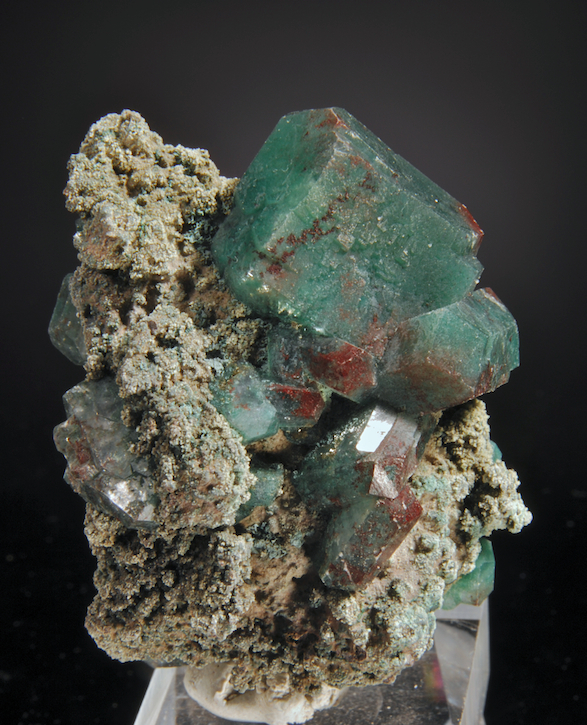 A fine and esthetic "treelike" or cruller specimen of velvety Rosasite on and mixed with malachite. There are some small Calcites as well for a little extra sparkle. 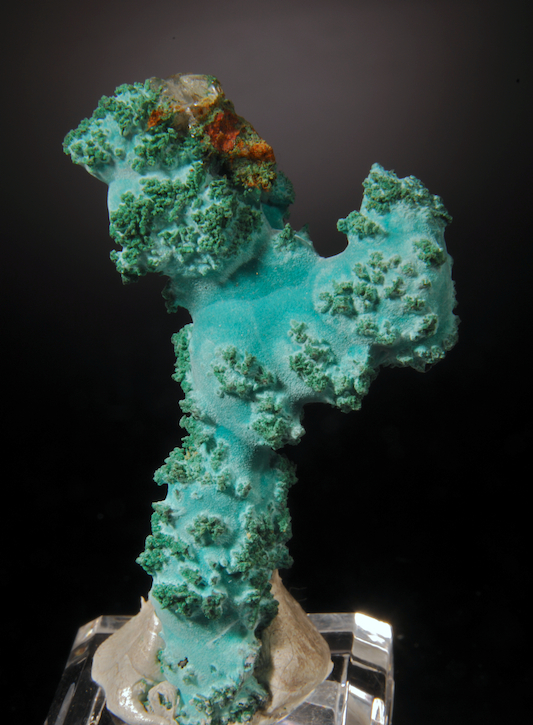 Mina Ojuela has produced the best Rosasite known, usually in finds often decades apart. This was from the last find in 2011, mostly low quality but with a few outstanding pieces. I selected this from a small group of the very best. While not large, it has great color, form and eye appeal that make it an affordable yet worthy addition for any collection. A nice small cabinet piece with well defined yellow ("chrome") Cerussites from finds before 2002 at Daoping. A nice addition is micro areas of Caledonite and Linarite. With magnification some linarite is seen included in the Cerussite. 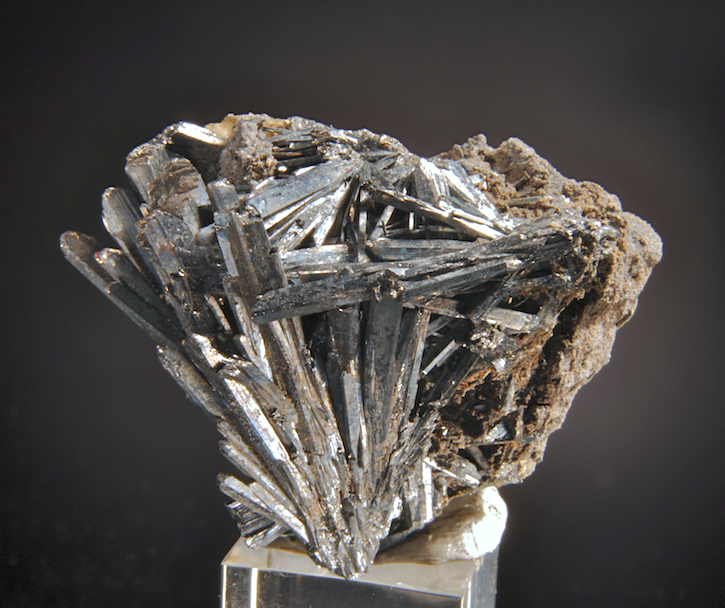 This mine is world famous for its Pyromorphites and a few other Lead secondary minerals, but it is much less known for its copper secondaries. This fine example combines both elements. At last, something really new, pretty and quite different from the Deccan Plateau of India! A very few of these were presented in the Fall Denver show, but the dealers who had them did not agree on the exact location and the prices were often very high. It was a short lived sensation as all were sold quickly. 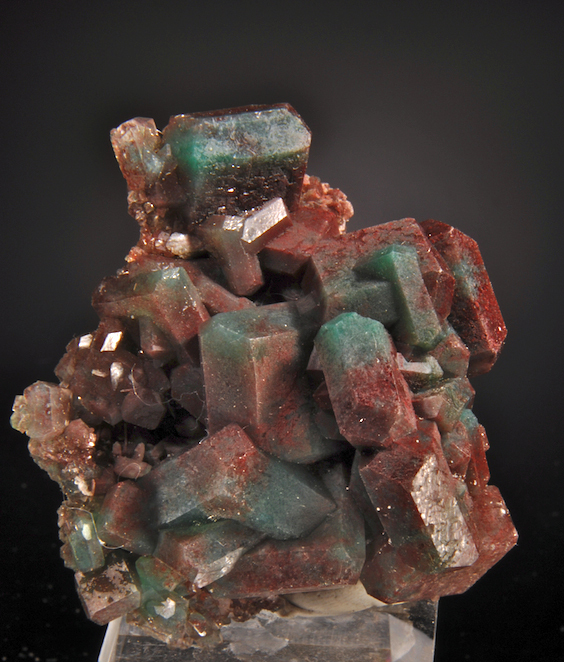 This example is above average quality, with crystals to 2.8 CM, bi-colored both a deep apple green and a brown to purple-red. Nice contrast with the matrix and in perfect condition too. The location listed by one dealer is Shiurampur and for now I will use that information pending a verification. 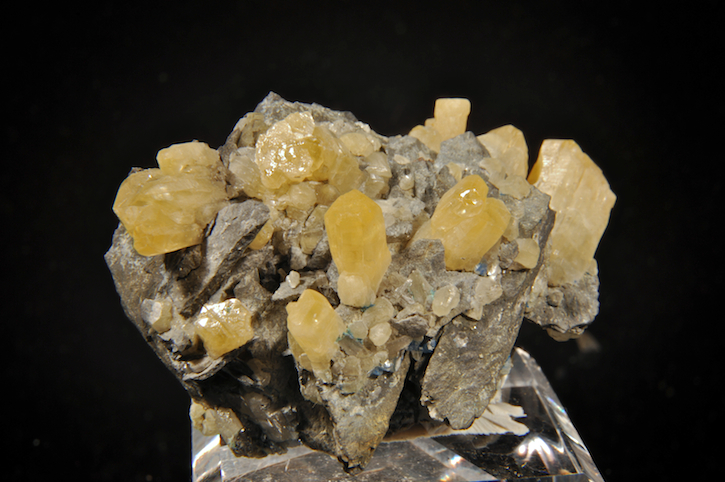 A nice addition for any Zeolite or Indian mineral collection! At last, something really new, pretty and quite different from the Deccan Plateau of India! A very few of these were presented in the Fall Denver show, but the dealers who had them did not agree on the exact location and the prices were often very high. It was a short lived sensation as all were sold quickly. This is a better than average example in perfect condition at a more reasonable price. For now the best location we have is Shirurampor, that will be verified soon I expect. An esthetic, dark piece with deep color and nice luster. 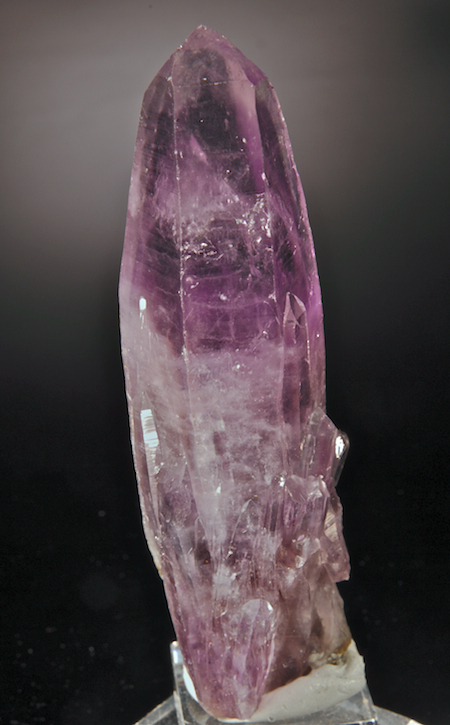 The crystals are a dark apple green with red-purple zones that adds a lot of nice contrast. We do not usually list many Indian Zeolites unless it is something especially great, and this stuff counts!